The term [plexus] comes from the Latin term [plectere] meaning " to twine, or to braid". In anatomy, the term [plexus] refers to a group of structures that are intertwined or form a meshwork. The plural form is [plexuses]. Gabrielle Fallopius used the term to denote "a tangle of nerves"
There are many plexuses described in the human body. Most are formed by nerves, but there are many that are lymphatic or vascular. The best known are the plexuses of nerves formed by the ventral rami of the spinal nerves. These are the cervical plexus, the brachial plexus, the lumbar plexus, and the sacral plexus. 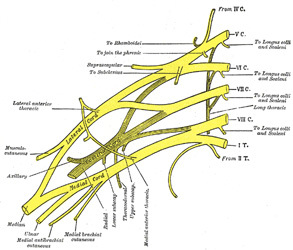 The image depicts the brachial plexus. For a larger version, click on the image, and for further information on the cervical and brachial plexuses, click here.